This edition has undergone significant revisions to make it more encompassing of the business start-up process. Thus, you will find chapters on human resources and traditional advertising methods. What does it take to go out on your own and where can you find ideas to start your business? You could manufacture your own products or sell other peoples’ products. Alternatively, you could offer a service. But first, you have to find out if you can sell your products or services and if there is a market for them. Find out where to obtain the latest marketing information and how to establish your marketing strategy. This 2018/2019 Edition has been updated and revised to reflect the many changes that have taken place in the sources of marketing and statistical information. Also, a chapter has been added on Intellectual Property and how to protect your inventions in light of the high level of theft by China. It covers the registration and legal form you can choose for your business. It also points out how the Government will tax it. It will help you set your objectives. Consider the advantages of operating out of your home and be cautious of leasing commercial premises. Technology has made starting your business much easier than it was 30 years ago. Computer hardware and software can help you run your business more efficiently and save time and money. Accounting software will help you deal with your financials and taxes. Customer Relationship Management software will help you to communicate with your customers more effectively. Learn about off-line and online advertising and how to create your own website that will allow you to sell your products online. Find out how to sell through Amazon, eBay, CraigsList or Etsy. Social media makes it easier for your start-up to inexpensively compete with huge corporations. Determine how much money you really need to get started. Can your business bootstrap itself once it is up and running? Take a look at how crowdfunding could help you. Learn about cash management and cost control. Find out what to do if your business runs into financial trouble. Iain spent five years as a financial analyst and knows what makes business tick. For fourteen years he operated his own businesses in importing, high technology and manufacturing. He is now a small business consultant and also owns a book publishing business. He writes from his personal experience in the trenches, as an entrepreneur and consultant, and shares these insights with you. He holds degrees from the Universities of St. Andrew's in Scotland and Oxford. 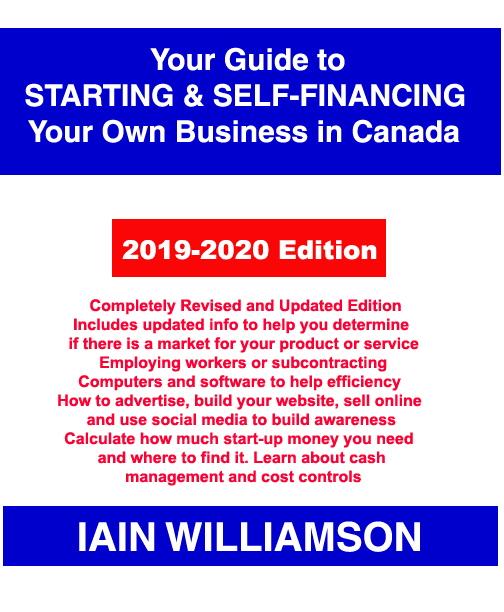 Your Guide to Starting & Self-Financing Your Own Business in Canada: 2018-2019 Edition; by Iain Williamson; 340 pages; softcover; ISBN 978-1-55270-796-8; ISSN 1191-0518; published in August 2018; Canadian $64.95. CHAPTER 1 Join the Entrepreneurial Revolution! What is an Entrepreneur, Anyway? What is the Canadian Government's Part? CHAPTER 2 Have You Got What it Takes to Become an Entrepreneur? Pay Attention to Disruptive Technologies! CHAPTER 4 What's Involved in Developing a New Product on Your Own? How Do You Protect Your Invention? "Fair Use" and "Fair Dealing"
CHAPTER 6 What's Involved in Selling an Existing Product? CHAPTER 7 What's Involved in Starting a Service Business? CHAPTER 8 Is There a Market for Your Product or Service? What Should Your Marketing Survey Tell You? Get to Know Your Competition! Logo, Business Cards, Letterhead, Legal Documentation, etc. Are Your Strategic Objectives Realistic? How Legal is it to Work Out of Your Home or Apartment? Watch Out for the Lease Renewal Trap! Desktop, Laptop, Netbook or Tablet? Be Alert to the Cost of Colour Toner Cartridges! Save Money by Staying Behind the Technology Curve! Is Your Consumer Audience Made up of Yuppies, Guppies, Boomers or Geners? Positioning and "Out of the Ordinary"
How Long Should Your Letter Be? What Do We Mean by Fax Broadcasting? Is There Enough Money to be Made with Direct Mailings? How Can You Use Social Media in Your Business? Caveat: Social Media is "Social" not "Business Media"
Watch Out on Paid Advertising! CHAPTER 23 How Many Employees Do You Need to Hire? It May Sound Crazy but Prepare Your Own Job Description! Are Employee Share Ownership Plans a Dream? What's Your Start-up Going to Cost? Will Your Cash Flow be Adequate? Can Your Business Finance Itself? How Long Will it Take to Arrange Financing? CHAPTER 26 Can You Bootstrap from the Get-go to Provide Enough Financing? How Far Can You Go it Alone? How Much Money Does it Take to Start? Can You Supply You Own Capital? Could Licensing Reduce Your Cash Outlays?